This unique book delves into the mysteries of human fetal growth and maturation. Growing knowledge in genetics indicates that factors that impact on/influence fetal growth and maturation may have a role in determining a person’s health and disease in later years. Placental, maternal, environmental, nutrient as well as fetal genome factors each play a role in producing a healthy, unhealthy or abnormal baby. 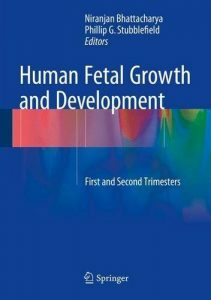 A study of fetal growth and maturation is therefore basic to the understanding of why fetal growth problems occur, what implications these can have for adult disease, and how clinical intervention can help to reverse growth problems. The present study will be comprehensive and will be a major contribution to the fields of gynecology, genetics, obstetrics, biochemistry, molecular biology and clinical medicine. It will include cutting edge research in the field as well as explorations on clinical interventions in fetal growth, which will not only add to existing knowledge but also prompt future research. her medical scientists, clinical practitioners, embryologists, endocrinologists, immunologists, gynecologists, obstetricians, reproductive and molecular biologists, geneticists and many others to create a state-of-the-art book on a subject with increasing demand for further knowledge. It aims to integrates different disciplines to give a holistic view of human fetal growth maturation.